Nityananda Prabhu appeared in the village of Ekachakra, in West Bengal, India, around 1474. In the Caitanya Caritamrita and other scriptures He is declared to be the avatar of Lord Balarama, the direct expansion of the Supreme Personality of Godhead, Krishna. As a child He was called Nitai and had a close circle of friends. Together they used to imitate the pastimes of Krishna and His associates. The adults of Ekachakra were fascinated by this unique little boy and loved Him as their own. Seeing His total absorption in avatars of Krishna, they suspected that He might be some sort of incarnation Himself. Day after day he would enact a different pastime, and did it so skillfully that His neighbors wondered, "How is it that He is so talented? How does He know the stories so well? No one has explained all these details to Him." On one occasion, one of the boys dressed as Akrura and took Krishna and Balarama away from Vrindavana on the order of Kamsa. Nitai cried in grief, feeling the separation of the cowherd girls from Krishna. Tears of love flowed from His eyes. His acting was so authentic that it made all who watched question whether He was merely acting or in some way experiencing the part He played. This was true whether He was playing Krishna, Balarama, or even Vamana and other Incarnations of the Lord. When questioned, Nitai would respond: "These are My own divine pastimes, and I am allowing you to see them." Among His most convincing roles was that of Lakshmana, brother of Rama, which intimated His divine identity as Balarama. For His first twelve years, Nityananda Prabhu stayed in Ekachakra and shared loving pastimes with His neighbors. Just before His thirteenth birthday, however, a traveling mendicant came to His home and was welcomed as a guest by Hadai Pandita, Nityananda's affectionate father. With deep respect and hospitality, Hadai Pandita offered his eminent guest all that he had. "Please feel free to take whatever you like," he said. "My home is your home." The visiting ascetic explained that his was a simple life, and that his needs were minimal. However, he said, he needed a traveling companion, and young Nitai would be an appropriate person for such a service. Nitai was eager, and reluctantly, Hadai Pandita agreed to let his son go. Nitai traveled from holy place to holy place for the next twenty years, until He was thirty-two, receiving instruction and friendship from His elderly sannyasi companion. He journeyed the length and breadth of India and sanctified the subcontinent by His presence. As Nitai continued to travel, feeling the ecstasy of these sacred places, He more and more took on the character of an avadhuta, a spiritually elevated person who is aloof to material surroundings and appears crazy to the uninformed. His mode of activity and general behavior became increasingly unexplainable; no one could understand what motivated Him or why He behaved in certain ways. For example, He sometimes danced ecstatically with the cloth meant to cover His loins wrapped instead around His head. In Pandarapura (present-day Maharashtra), Nityananda Prabhu met the saintly guru Lakshmipati Tirtha. It is said that Lakshmipati Tirtha was given to intense dreams about Lord Balarama, and when he met Nityananda, he was convinced that this beautiful young personality was none other than Balarama Himself. They soon developed a deep, devotional relationship. According to some authorities, Lakshmipati initiated Nityananda Prabhu at this time, giving Him the student name "Svarupa." Lakshmipati's most famous disciple was Madhavendra Puri, who received direct instructions and gifts from the deity of Gopinatha. Because Madhavendra Puri was His senior, Nityananda Prabhu always treated him as though he were His spiritual master. Soon Nityananda Prabhu reached Vraja, or Vrindavan, the Land of Krishna. His ecstasy increased one million times. Visiting the many places associated with Krishna's pastimes, He shouted, danced, rolled around, laughed, and howled like a madman. With overwhelming intensity He cried out, "Where is Krishna? Where is My very life and soul?" As these words emanated from His anxious lips, He shivered uncontrollably and tears of love poured from His eyes like torrents of rain. At that moment, He had a startling inner vision of Lord Chaitanya Mahaprabhu, who had completed His childhood pastimes and was now overtly engaged in His mission. This realization made Nityananda chortle with affection for His spiritual brother, and so from Sringara-vata He proceeded to Navadvipa to join Mahaprabhu in His pastimes. "Salutations to Sri Nityananda Prabhu, Who has a single pearl suspended from one of His ears, Who is the elder brother of Sri Chaitanya Mahaprabhu, and Who is the purifier of the world." The year was 1506, and after arduous travel through dense forests in a trance-like state of devotion, Nityananda Prabhu reached the land of Nadiya, where Chaitanya Mahaprabhu resided. When the two Lords finally saw each other for the first time, they were immediately overtaken by waves of ecstasy. 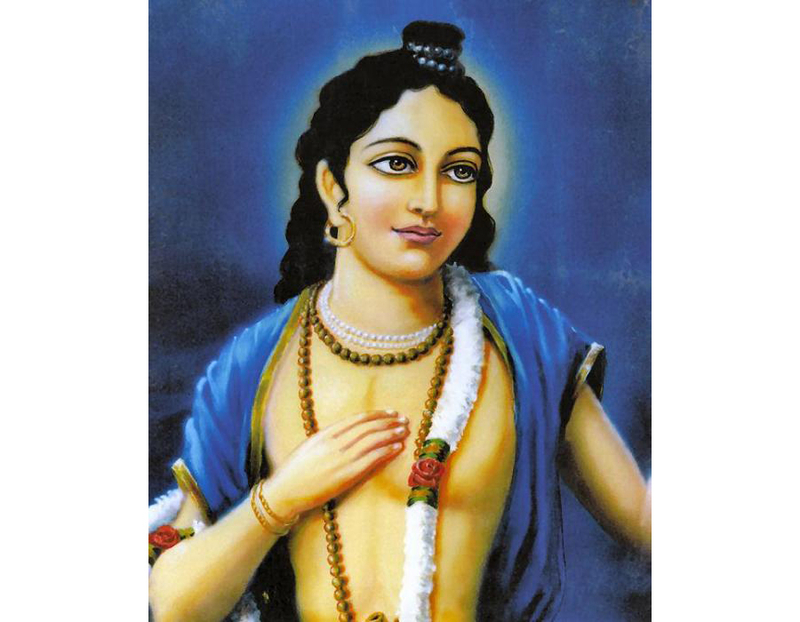 Nitai was roughly thirty-two years old, and Mahaprabhu was twenty. They each felt that their lives were now perfectly complete. Embracing, they cried what seemed like rivers of ecstasy. Nityananda Prabhu, who is identical with Lord Balarama, the first expansion of Krishna, is considered to be the original guru for all of mankind. Thus, soon after their initial meeting, Lord Chaitanya Mahaprabhu tried to honor Nityananda Prabhu with a Vyasa-puja worship ceremony befitting a great spiritual master. However, Nityananda Prabhu protested and grabbed all of the worship articles from Mahaprabhu and worshiped Him instead. Nityananda Prabhu kept repeating, "Nimai Pandita [Mahaprabhu] is my Lord and master! Nimai Pandita is my Lord and master!" There was constant competition as to who would serve whom. Their transcendental love for one another is indescribable. From this point until Mahaprabhu left Navadvipa for Jagannatha Puri, Nityananda Prabhu was always at His side. The two biographers Vrindavana dasa Thakura and Krishnadasa Kaviraja Goswami clearly assert that Nityananda Prabhu holds the key to Mahaprabhu's heart. The teaching of the Chaitanya tradition is emphatic: One who thinks that he can attain love of God without first attaining the mercy of Lord Nityananda Rama is living in a hallucination. Mahaprabhu asked Nityananda Prabhu and Haridasa Thakura to serve as His door-to-door preachers, spreading the message of love of God to every home in Navadvipa. It was at this point that Nityananda and Haridasa met the two brothers Jagai and Madhai. They were descendants of an illustrious priestly dynasty but had abandoned the pious ways of their forefathers for a life of debauchery. When Mahaprabhu heard what had happened, He became infuriated and rushed to the area Himself. How could anyone harm a gentle soul like Nityananda? Summoning His divine disk-like weapon, which is flaming and radiant, Mahaprabhu was prepared to kill the two repellent brothers on the spot, forcing them to taste the wrath of God. His anger, however, was assuaged by Nityananda Prabhu, who reminded the Lord that the majority of people in this age are as fallen as Jagai and Madhai, and that it is His mission to liberate them with love, not violence. Hearing these words, Mahaprabhu was willing to forgive Jagai. But Madhai, who had perpetrated the evil deed, needed to be forgiven by Nityananda Prabhu Himself. Nityananda Prabhu's mercy knows no bounds, and He quickly forgave Madhai for all that he had done. When Jagai and Madhai saw the loving exchange between Mahaprabhu and Nityananda and, observed Nityananda's forgiving nature toward them, their hearts were changed. They resolved to become devotees and enthusiastic supporters of Mahaprabhu's sankirtana mission. Seeing their sincerity, Mahaprabhu took all of their sins on His own head. For a few brief moments, His beautiful golden body turned an unsightly blackish color. Indeed, when Yamaraja's assistant Chitragupta tried to tally Jagai and Madhai's collective sins, he could not do so, and collapsed from exhaustion. After the incident with Nitai, however, Jagai and Madhai set the highest standard of devotional service by constantly chanting the holy names of Krishna and instructing others in devotion to Him. After Chaitanya Mahaprabhu took on the renounced order of life, sannyasa, to spread the sankirtana movement of the congregational chanting of Krishna's holy names, the two brothers moved to Jagannath Puri, on the east coast of India. There, Mahaprabhu left Nityananda and proceeded on a tour of South India that was to last for two years. When Mahaprabhu returned, He was pleased to see that Nityananda had developed the movement in Puri with the help of the local devotees. However, the movement in Navadvipa had been sorely neglected, and so, in 1511, Mahaprabhu requested Nityananda, His most reliable sankirtana commander, to return to Bengal. When Nityananda Prabhu first returned to Bengal, He began His mission in Panihati, a village north of Calcutta. For several months He preached and gathered followers in this area, until thousands chanted and danced in ecstasy under His supervision. It was at this time that Raghunatha dasa Goswami, then a young boy, approached Nityananda Prabhu as a surrendered servant. Since Raghunatha was born into a wealthy family, Nityananda asked him to hold a huge festival in which all the devotees could have as much yogurt and chipped rice as they desired. The festival at Panihati was a grand success, drawing pilgrims from miles around to participate in various ways. This naturally enhanced the sankirtana movement and pleased Nityananda very much. In Panihati, Nityananda Prabhu used the house of Raghava Pandita as headquarters, and from there taught Krishna consciousness to thousands of people from both sides of the Bhagirathi River, a branch of the Ganges that flows in that area. From there, He moved on to Varahanagara, where he stayed in the house of Gadadhara dasa. He transformed this small dwelling into another center for the movement. It is said that He moved the people of this area so thoroughly that even children would come from neighboring villages on school days, just to join the kirtana. After a fruitful period in these places, starting preaching centers, Nityananda Prabhu arrived in Saptagrama, a town who's inhabitants were mostly considered outcastes and untouchables by Hindu standards. Lord Nityananda Prabhu viewed all souls equally and spread Mahaprabhu's teachings lovingly to everyone He met. Nityananda Prabhu traveled on to Shantipur and Navadvipa, where He went door-to-door and begged people to surrender to Mahaprabhu's sankirtana mission. He carried this request to Thanajora, Baragachi, Dogachiya, Fulia, and all villages on both sides of the Ganges. At Khardaha, He is said to have converted no less than 1,200 male and 1,300 female Buddhists. Nityananda Prabhu's most important followers joined Him at this time. With their help, He was successful in spreading Krishna consciousness throughout Bengal. When Nityananda Prabhu returned to Bengal at Mahaprabhu's request, He decided to abandon His avadhuta status and get married. A village leader named Suryadasa Sarakhel had two daughters who were great devotees; their names were Jahnava and Vasudha. As qualified girls who felt great affection for Nityananda Prabhu, they were chosen to marry Him, and He, in turn, reciprocated their affection. According to the poet Kavi Karnapura, the two girls were incarnations of Revati Devi and Varuni Devi, the wives of Lord Balarama. After some time Vasudha gave birth to two children, a boy named Virabhadra and a girl named Ganga-devi. Virabhadra later became a great leader in the Vaishnava community and continued to spread Lord Chaitanya's teachings in the mood of His distinguished father. However, soon after the birth of her two divine children, Vasudha passed away, and Jahnava vowed to raise them as her own. As the years went by, Jahnava Devi developed a reputation as a superlative Vaishnava, embodying the ideals of devotion in Lord Chaitanya's line. She initiated her son Virabhadra as well as many other male and female members of the Vaishnava community. Major figures in Mahaprabhu's lineage took shelter at her lotus feet, and personalities like Narottama Dasa Thakura, Srinivasa Acarya, and Syamananda Prabhu accepted her as the most prominent Vaishnava in Bengal. In Ekachakra, not far from his birthplace, Nityananda Prabhu established a deity of Lord Krishna known as Bankima Raya, accompanied on the right by a deity of Jahnava Devi, and on the left, Srimati Radharani. The priests of this temple say that Nityananda Prabhu merged into the form of Bankima Raya to leave the earth for His eternal pastimes in the spiritual sky. There are no other stories of Nityananda Prabhu's departure, and so this one is generally accepted by the Vaishnava community. Be that as it may, His presence is always felt in the presence of one's own guru, for the guru is considered to be a living manifestation of Nityananda Prabhu's love, and His power is what gives a disciple the ability to perform devotional service and experience the bliss of devotional life.